Copper panel inlaid and carved with a mask of Okina lying on a spray of chrysanthemums and daisies. 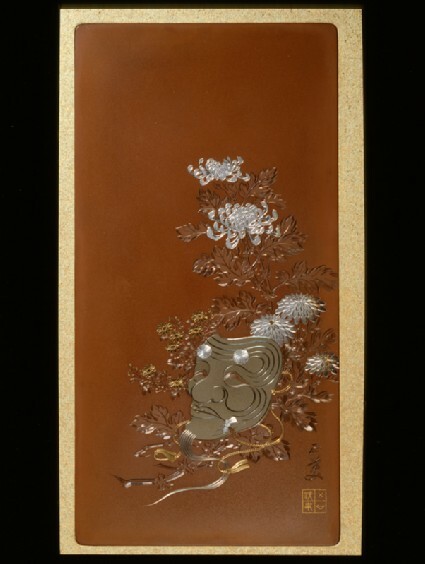 Engraved signature: Yotsuya Seibi with gold inlaid seal. The silver has been cut here to shine, brilliant cutting, and is preserved with its original lack of patina by the fact that it is glazed and hence free from the tarnish due to oxidation. The maker is little known, but clearly was a pupil to one of the great masters, possibly Unno Shōmin at Tōkyō Art School. Although technically too late for our period, it is illustrated here as an example of the continuation of Meiji craftsmanship well into Taishō period. The frame and mounts are original.